Tuna is a staple for many Americans. Think tuna melts, tuna salad, spicy tuna. Can you imagine a sushi menu without Bluefin sashimi? But unlike most other everyday ingredients, some tuna is on the verge of extinction -- yes, we said extinction -- and tuna fishing is plagued with stories of human trafficking. Tuna fisheries are also accused of causing devastating bycatch that kills over 80 other species on a daily basis. "In the past few years, we've consumed large fish at a higher rate than ever before," Jonathon Sawyer writes in Esquire. "The international fishing community's technological advances and lack of enforceable regulation have allowed us to fish deeper, farther, and longer to the point where 85 percent of the world's fisheries are fished to capacity or overfished. We're eating fish faster than most species can reproduce. Tuna and cod have turned out to be two of the biggest losers." Over the last half century, populations of tuna have declined by an average of 60 percent. Populations of Pacific Bluefin and Southern Bluefin have declined by a drastic 90 to 95 percent. Mature adult Pacific Bluefin tuna are currently at only 4 percent of the population they would be at if they had never been fished. The United Nations' Food and Agriculture Organization reports that seven out of 23 commercially fished tuna stocks are overfished or depleted. Another nine stocks are threatened. In part, it's because we don't eat a wide enough variety of fish. Barton Seaver, the program director of Healthy and Sustainable Food at the Harvard School of Public Health, notes that Americans eat "about 16 pounds of seafood per person per year. About 95 percent of that comes from only 10 species. And three of them--salmon, shrimp, and tuna--account for more than 60 percent of our seafood consumption." Can you talk me through the types of tuna? Of course! First there's Albacore tuna. This can be bought canned, smoked or fresh. It's "near-threatened," with declining and overfished populations, according to Greenpeace. Then there's Bigeye tuna, which commonly appears as tuna steaks, sushi, sashimi or canned. This variety is considered "vulnerable." Bluefin--Atlantic, Pacific and Southern--is the tuna of highest value and with the greatest risk of extinction. You see Bluefin generally served as sushi or sashimi. Skipjack is often labeled "light tuna" when canned, and is not yet overfished. Finally, there's Yellowtail tuna, prepared as tuna steaks, sashimi, sushi, or canned. Yellowtail are "near-threatened," with declining and overfished populations. You also mentioned human trafficking...? Yes. Many fisheries are accused of tricking poor migrant workers into slave-like working conditions on tuna boats. A key aggressor in this area is Thai Union, who own of Chicken of the Sea and Bumble Bee canned tuna. Greenpeace U.S. Oceans Campaign Director John Hocevar has said: "If you eat tuna that is sourced from Thai Union, there is no way to be sure you aren't eating fish associated with slave labor or caught under extremely poor conditions." Yep. The way that tuna is fished is of major debate as well. Of most controversy is the Fishing Aggregation Device, or FAD. "A FAD is a stationary buoy with long ropes that descend into the water. Over time, small ecosystems develop around the ropes--including small plants, tiny fish, and eventually, larger predators. Once the FAD reaches an appropriate mass, a net is used to scoop the whole thing onto the boat," explains the environmental radio show Allegheny Front. This results in overfishing, enormous bycatch and capture of immature tuna. Ummm, is that all? Have we covered all the issues with tuna? Actually, no. As National Geographic reports: "The journal Nature Climate Change published a paper suggesting that the killing of ocean predators like sharks and tuna is increasing the speed of climate change and the ocean's ability to mitigate against it. It points to a 'trophic cascade' as the loss of so many top predators allows for increased numbers of sea turtles, crabs, stingrays and starfish. These herbivores are rapidly eating their way through the world's seagrass beds and digging up the ocean floor, damaging one of the world's most important systems for storing and cycling carbon." Ok. So why do we still eat tuna? See that earlier line about tuna melts and sashimi. Tuna has become engrained in both American and Japanese culinary habits. Only coffee and sugar take up more shelf space than tuna in U.S. supermarkets. Japan consumes 80 percent of the world's Bluefin. But some people are working to change our rates of tuna consumption. 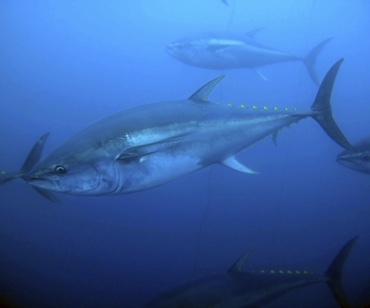 In 2010, the Center for Biological Diversity launched the Bluefin Boycott, which has garnered over 85,000 signatures from people who've pledged not to eat or serve tuna. The list includes owners of Blue Hill, Chez Panisse and Tataki Sushi restaurants. There is also the Seafood Watch Blue Ribbon Task Force, of which Jonathon Sawyer is a member. "Two years ago I made the conscious decision to give up tuna in my life and in my restaurants," Sawyer says. "It's delicious and I love it, but more important to me is that we have tuna to pass down to future generations. We can see the extinction of Bluefin and Bigeye in our lifetime. The decision to give up tuna was pretty easy for me." People argue: There are a lot of fish in the sea. Why should chefs tie themselves to tuna? That said, in Japan, calls for an end to Bluefin in restaurants have been met with cultural debate. "We are dealing with thousands of years of cultural customs," Ritchie Notar, co-owner of Nobu restaurants is on record saying. "The Japanese have relied on tuna and the bounties of the sea as part of their culture and history for centuries...It has to do with custom, heritage and behavior." Greenpeace recommends that when buying canned tuna, make sure the can has the species name, where it was caught, and the fishing method labeled. Go for 'pole and line', 'troll', 'handline' or 'FAD-free' products. Opt for skipjack and Pacific albacore tunas, or try a new species of fish. Eve Turow Paul is the author of A Taste of Generation Yum. Follow Eve on Facebook and Twitter @EveTurow, and learn more about her book, here!